Black and Red Dark Love themed badge. 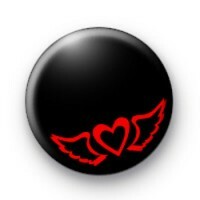 This black 25mm badge has a red love heart with wings, like an angel heart. The black and red colour make It more of a sassy love badge or a love badge with attitude. It is simple but romantic and if you like more of an alternative Valentine's vibe this would be the perfect badge for you to give as a handmade token of your love. We have lots of love, romance and Valentine's slogan badges in the shop so if you'd like a few more designs make sure to click on the Valentine's Badge Category.